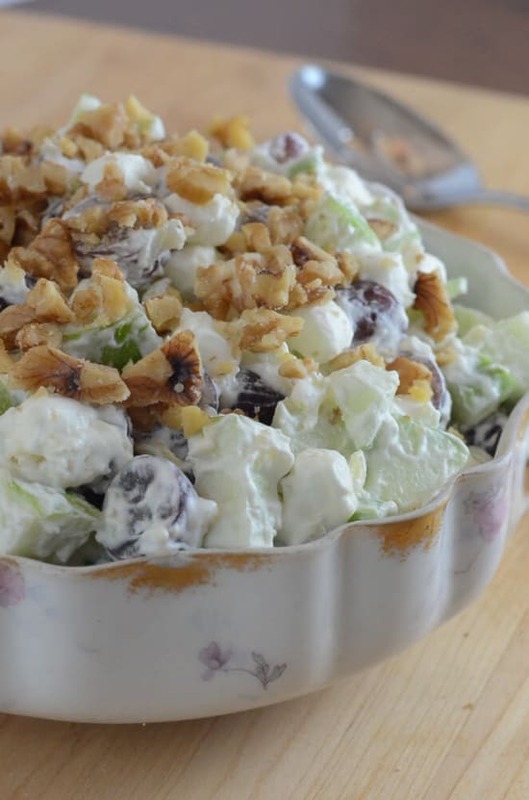 This is my mom’s sweet and delicious take on classic Waldorf Salad. It will add a fresh, crisp element to your holiday menu. This post was originally published on November 9, 2013. It has been updated with new images and a video. My mom really went to town on Thanksgiving. The food prep started early in the morning, before I was even out of bed, and the cooking continued throughout most of the day. By mid-day her apron was covered with flour from rolling out the most amazing, from scratch crescent rolls in existence and our house was filled with the smells of a great big turkey roasting in the oven with her traditional bread stuffing. Along with a bunch of other delicious dishes, this Waldorf Salad was a part of our Thanksgiving spread each and every year. 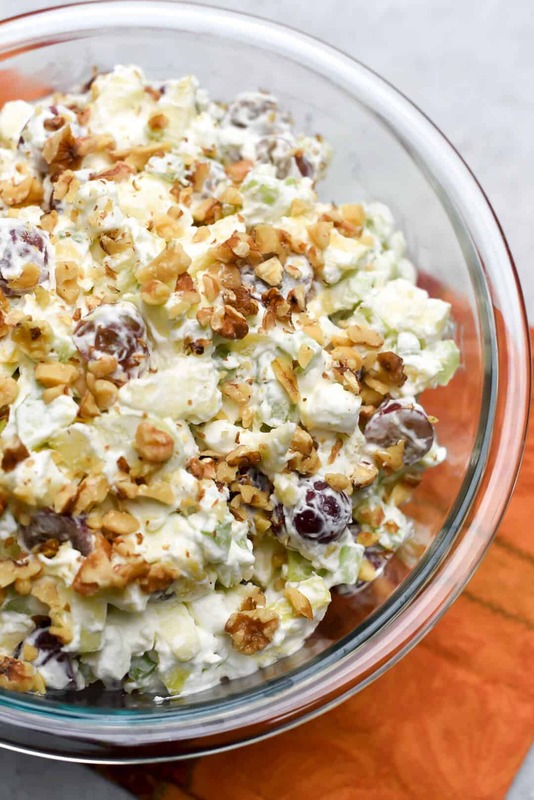 Traditional Waldorf salad calls for a simple mayonnaise dressing but my mom’s ambrosia-inspired version will always be my favorite. 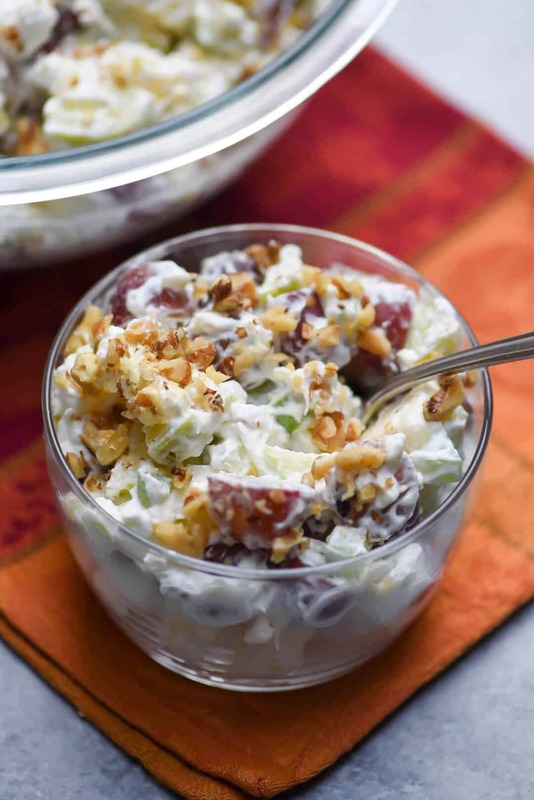 Like the classic version, this recipe consists of apples, grapes, and celery, but in place of a mayonnaise based dressing, she mixed some crushed pineapple and a little pineapple juice into fresh, sweet whipped cream. From time to time she would also add some mini marshmallows. They aren’t a necessary addition, but they make me happy. You can put this together in a snap with Cool Whip but it is SO delicious with homemade whipped cream. 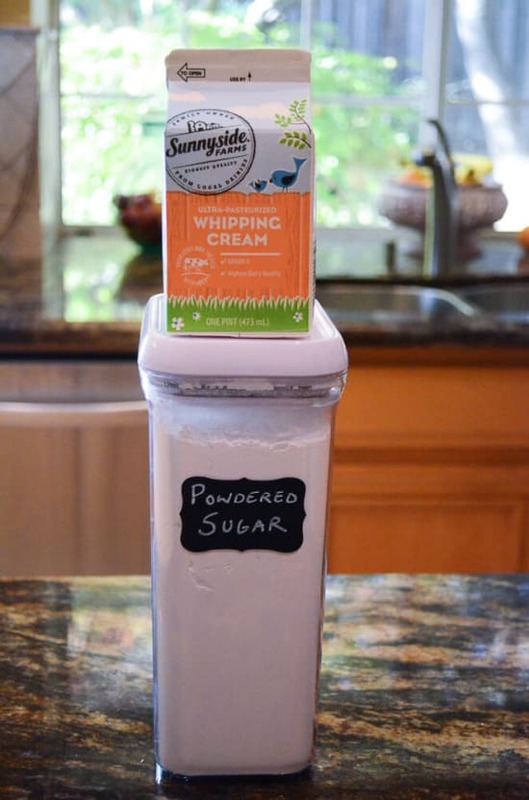 A couple of tips to ensure success when making homemade whipped cream. Fresh whipped cream consists of two ingredients, heavy whipping cream and sugar. You can use either powdered (confectioners’) or granulated sugar, but I prefer using the powdered variety since it dissolves easier. One cup of heavy cream will yield two cups of whipped cream. I place my metal mixing bowl and the beaters from my electric mixer in the freezer for about an hour to get them really cold first. Use your electric hand mixer or stand mixer on high speed to whip the cream with a couple of tablespoons of powdered sugar in the super chilled bowl until thick and creamy. When you see peaks form, pull the beaters out. You don’t want to beat it much past this point or the consistency will begin to break down. Cover the bowl with plastic wrap or transfer to a bowl with a lid and store in the refrigerator until ready to use. It will keep well for several hours. Check out the video below to see how the salad comes together. A cool, fresh, sweet addition to a holiday meal. I look forward to it every year! An image from the original post dated November 9, 2013. Combine apples, grapes, and celery in a large mixing bowl, set aside. In a separate smaller bowl, combine whipped cream or Cool Whip with the drained crushed pineapple and 1 tablespoon of the reserved juice from the can. Add an additional 2 tablespoons of the reserved pineapple juice to the fruit mixture and toss to combine. Fold the whipped cream into the fruit mixture and mix together. Fold in 1/2 cup mini marshmallows. Sprinkle walnuts over the top as a garnish and serve. Refrigerate any leftovers in an airtight container. Best if eaten within a few days. If the salad is made with fresh whipped cream, the leftovers will stay fresher for longer than if you use Cool Whip. Oh my…I LOVEE Waldorf salad sandwiches and always wanted to learn how to make my own! Thanks so much! I love that your mom added pineapple juice. Hi Lynna 🙂 I hope you give it a try. In all honesty this lookS amazing but the celery threw me off guard. I’m not a huge fan of celery but I won’t necessarily avoid it if it’s in food. Curiosity’s got the best of me and I have to try it. 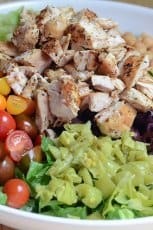 I love making all types of salads for holidays or special events. Fruit salads, pasta salads, potatoe salads etc. It’s such an easy way to change it up ( especially in my family’s home. They don’t like much change but I LOVE IT) anyways thanks for this recipe. My mom made this with fruit cocktail added to it…yummy! My grandmother made this also. She used little mandarin oranges instead of celery! She also added the walnuts. I will be making this for the holidays but will use the fresh little oranges and omit the walnuts! 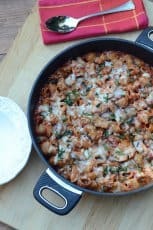 Thanks for the recipe as mine are all packed in boxes somewhere awaiting our move! You’re very welcome, Sherrie. Happy Thanksgiving! 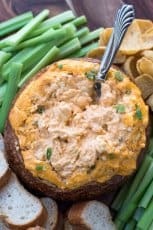 I like adding a new dish to the Thanksgiving feast, and this is it! It’s ready to be assembled in just a few short hours and, for many reasons, I’m happy not to use mayo 🙂 I’m sure it will be as great as it looks. Thank you for sharing! i am watching my carbs. 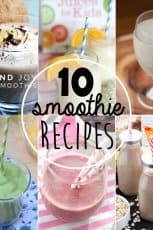 wondering if i could make this without the added sugar. You could always use a sugar free whipped cream and there is a sugar free version of Cool whip as well. The ingredient list says 1 cup marshmallows, but the instructions indicate 1/2 cup. Can you please clarify? Sorry about that, Cassie! You really can add as many as you’d like. More or less, according to your taste. 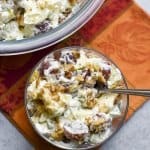 I’ve never had waldorf salad! It looks amazing!! Sometimes the oddest-seeming food combinations turn out the best. I love your beautiful Waldorf salad! Perfect for out holiday table with so many delicious textures and flavors—a classic! Thanks so much, Liz 🙂 I hope you and your family have a wonderful Thanksgiving! I like to add chicken, and curry to my salad. Wonderful for a luncheon. 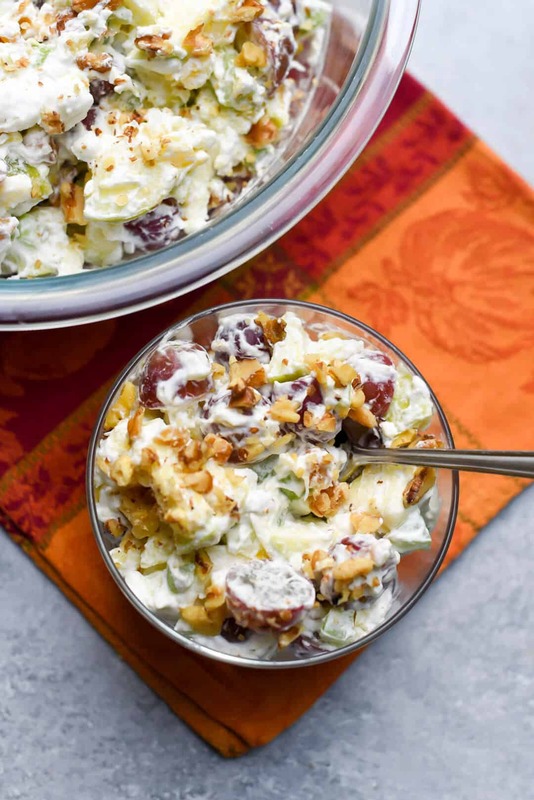 Can the Waldorf salad be made the night before? I think it’s best made the same day served, Deborah.